When I was younger I was a fan of science fiction B movies. One of my favourites starred Robbie the Robot along with that dark haired serious ‘actor’ that was Leslie Nielson. 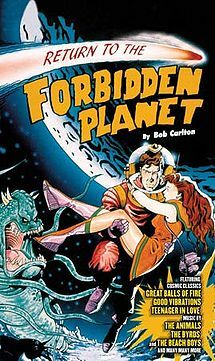 That film was the 1956 movie The Forbidden Planet. I loved the theory of alien technology bringing to life the monsters of the id, in order to frighten off the visiting ship. I loved the idea of space travel, and was fascinated by the ideas of colonisation of abandoned alien worlds. I thought the direction was stylish, and the plot simple to follow and understand. But you know what? I was wrong. As a teen, I discovered the stage show ‘Return To The Forbidden Planet’ and I watched it as many times as I could when it was on nearby, being thankful for student discounts on already reduced tickets, if there were any available 15 minutes before the show began. I shrieked the songs out at the top of my lungs with everyone else. I enjoyed the audience participation. It was almost like a Rocky Horror, only without the dressing up. Unless off course you counted the faded, fan tour t-shirts of fans that turned up in their hundreds. 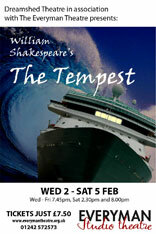 It was at the same time that I discovered that both the film and the stage show were based on the Shakespeare play The Tempest. In an effort to learn more, and thanks to a parental unit with good friends at the Royal Shakespeare Company, I managed to go see the play performed in Shakespeare’s home town of Stratford. Typical of such a company it was a huge, well oiled production with the great names of theatre at the time (not that I remember any of them). The strange thing is, it wasn’t until two days ago, when I watched a different production of The Tempest, that I *understood* everything. The film, the musical and the stage show play. You may find this strange, you may not, but as I sat transfixed and watched, I felt a wry grin spread across my face, and the rusted cogs of my cognitive synapses begin to grind against each other slowly as I drip fed them with fresh oil. Two days ago I went to the Everyman Studio (part of the Everyman Theatre) in Cheltenham. The Everyman Studio is brilliant, because it is just that, a studio. It’s tiny. There are three raked rows, each of 14 seats, lined up against the length of one wall, and that’s it. The rest of the floor space is the stage. I went to see the Dreamshed Theatre Company’s adaptation, and as I said I was transfixed. The enclosed performance area, made you feel like you were watching live theatre in you living room, gave the whole show an almost personal feel. I am sadly at the moment lacking the lyrical dexterity with which to purvey the amazing job done by each and every one of those actors, that night, but suffice is to say, that I haven’t as yet shut up about telling people how fab it was. The Forbidden Planet was a movie far ahead of its time – many of the cinematic effects that we take for granted now were pioneered in that film and some of them have never been bettered. I can never forget the monster made visible only by the fire from the blasters. Thanks for reminding me of this excellent movie – must get a copy for our home library.